Property was quiet, clean and was walking distance to downtown Breckenridge. Kitchen well stocked with basic cookware, dishes and essentials. We enjoyed the time spent there and definitely will be on our preferred list of destinations. Great house, great location, great family vacation! This home is beautiful! We had 10 family members stay for 5 nights and had a great time! The pictures are true to how lovely the home is. The home had every amenity you would ever need. We loved the two different family rooms, the views, and of course the hot tub! One suggestion I would make is to have a screen to partially close the bunk bed room with the foosball table. We had 10 adults stay and one couple did not feel they had any privacy. Fantastic, well equipped condo! We had an amazing time in Breckenridge. The condo was perfect for my family of 6, having plenty of room for everyone. The kitchen was well equipped. The couch and loveseat were amazingly comfortable and perfect for afternoon naps. I could not believe how quiet it was! I particularly enjoyed the small natural creek that runs outside the master bedroom window. The only issue we had was the washing machine leaked. Although when we alerted the management company, they had it fixed immediately. Great service! If we come back to Breck, we will certainly stay in this condo again. This studio was perfect! This cozy, well decorated, studio couldn't have been any better for our family of 3. There was just the right amount of space. The beds were very comfortable and plenty of room in the bathroom and kitchen. The kitchen was well stocked with everything you would need to cook a meal. The view was gorgeous and we didn't need to use our vehicle because it was right off the main strip. The front desk always had a smile on their face and said "Hi" everytime we walked past. Would highly suggest this studio! Great vacation. Nice condo! A few minor things came up during out stay, however they were taken care of immediately. A bathroom for each bedroom was great for the amount of people we had. Bedrooms were spacious! Thanks for a great time. The check in process was extremely easy. The staff was very helpful and easy to work with. The condo was well appointed and very clean. Our kids loved the trundle beds. The patio also had a nice view of the mountains. 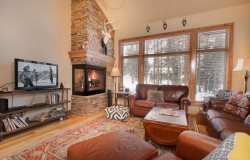 Superb apartment with terrific amenities in what is arguably the best location in Breckenridge. Yards away from Peak 9 chair lifts where there are seldom any Qs. Close to downtown shopping and restaurants. Very cute and close to town. Short walk to town and the gondola! Beautiful condo and a great experience! Great location, clean and tidy condo. Great Convenient location. Very nice and convenient location. Walking distance to bars. The perfect location for the perfect weekend. Very close to slopes. Very comfortable condo and you can walk to town and to slopes. Could use a few updates but overall was nice.